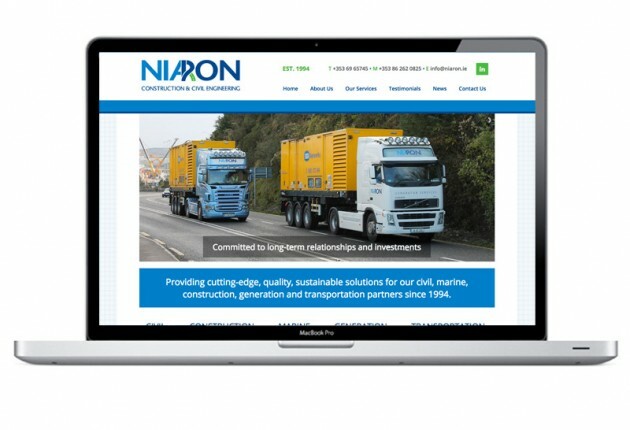 We were asked by Niall Keane, Managing Director for Niaron Ltd. based in Foynes, Co. Limerick, to design their new mobile responsive website. 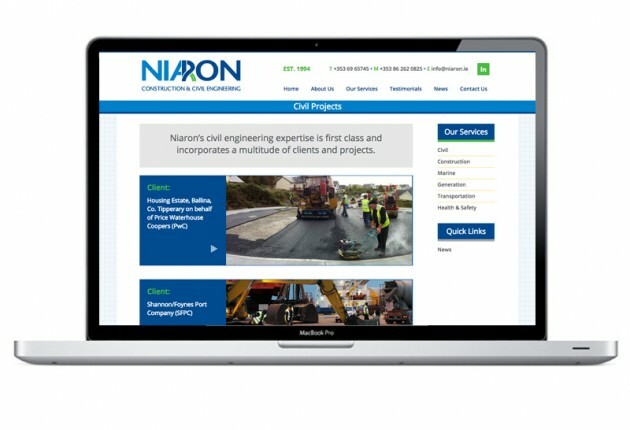 Niaron Ltd are a leading Construction and Civil Engineering company in Ireland. Offering flexible, multi-disciplined solutions, they Project Manage civil, marine, construction, generation and transportation works for a range of semi-state and private organisations. Mastering challenging and technically-complex projects, they pride themselves on their ability to innovate while uncompromising on safety and performance. Celebrating two decades of industry success, family-run Niaron is unrivalled in terms of consistency and personal touch. With a dedicated client base that includes ESB Networks, Shannon/Foynes Port Company (SFPC), Bord na Móna, Shannon Estuary Anti-Pollution Team (SEA-PT), Limerick and Tipperary County Councils and Price Waterhouse Coopers (PwC), they are recognised for their reliability and diligence and their commitment to a sustainable environment. As with all projects we work with our select strategic partners to develop the website including the copywriting and website development. We worked through the design brief to understand the business and their goals. It was our job to communicate visually the level of expertise and fantastic client base mentioned above. As with all websites, working through and defining the navigation provides the foundation for which to design the site. All features were discussed and planned. The main features include the sliding banner which allowed us to visually comunicate the unique seling points, together with strong taglines. The breakdown of the sericves nnedde to eb very clear adm these five buttons sit neaytly under the sliidng banner. They are also accessed through the general drop down navigation. ‘Latest News’ and ‘Recent Projects’ are important on the home page and keep the content fresh. The corporate colours are consistent across the site which looks profesional and fresh. The main area of interest on the site is the breakdown of the Client projects. As with all of our sites, the layouts are bespoke and fit to the Clients needs. Each of these includes a gallery demonstrating the process and completed project. The website is of course mobiel responsive and easy for the Client to edit using WordPress. We are very happy with the new website and look forward to working with Niall Keane and his team in the future. 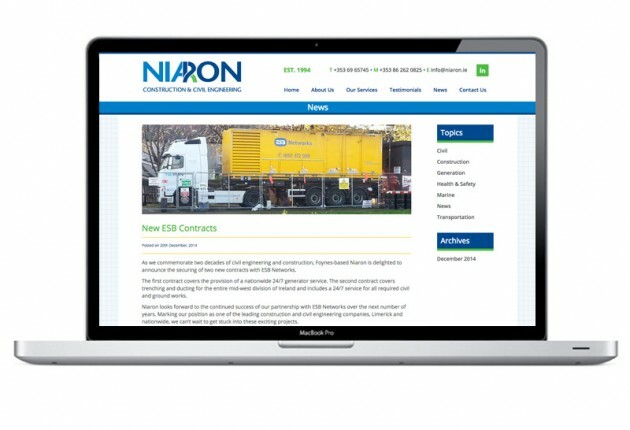 Log onto www.niaron.ie to view their website.